Hello and welcome to 124 Spider Abarth Forum, the premier community for 124 Spider Abarth owners from around the world. Please take a moment and post your introduction and let us know a little bit about yourselves. Just snagged my Spider a couple of weeks ago. I traded in an Alfa Romeo 4C for it -- had to go with something with a smaller hit to my wallet since we just upgraded to a much larger house. It was an unexpected move, but the perfect house hit the market so we had to jump on it. I've only racked up a few miles on the 124 Abarth, and now she'll sit in my garage under her car cover until Spring. But, I really like the car. Not as fast as the 4C, but much more comfortable and less scary. Plus, I plan on modding the crap out of the Abarth. I've already purchased fender badges, red mirror caps and tow hook cover as well as the red trim piece for the splitter -- just waiting for some warmer weather to install. Most of my mods will probably be with Eurocompulsions since that's who I used to mod the Alfa, and I trust their quality and customer service. That being said, I've already ordered stuff from Madness, Auto Ricambi, and Mopar in addition to Eurocompulsion -- and I'll probably use Goodwin racing and some other vendors as well. Looking forward to getting to know you all and picking your brains. Wow she's beautiful, welcome aboard. 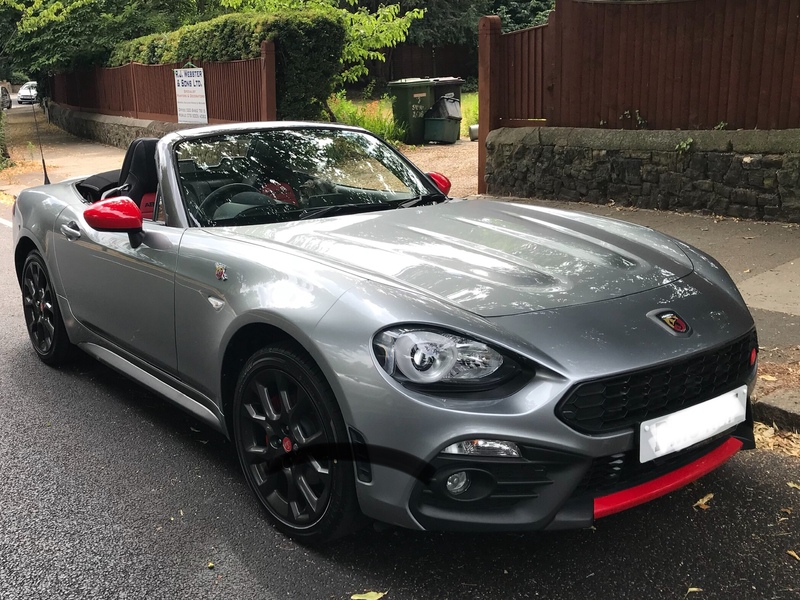 Hello, - purchased Abarth Spider couple of months ago, in Rosso red. Been busy adding a few mods to bring in line with the European spec. Absolutely love the car, and looking forward to being part of the enthusiasts' forum. Just took delivery of my Abarth 124 Spider this past week. Awesome car. Mine is Grigio Argento with the Black Heritage stripe. 6 speed manual with the Luxury package. It had 721 miles on it went I bought it. The previous owner had it for about 2 months and traded it in on an Audi because his wife didn't like the car. He had bought it for her as a surprise. Oops. Feel bad for the guy. But I got a really stupid great price on it so bam! I own an Abarth. Very impressive car. Handles unbelievably. Fast enough and drop dead gorgeous. As soon as I figure out how to post pictures I will do it. Can anyone tell me how? I have some great shots ready to be posted. By the way, where did you get your car cover? Is it rain proof?